We got home about 5 pm on Friday and Ally is doing well. Docs were concerned that it might be too soon to go home, but I shared my feelings and they let us go. I am thankful for everyone at the hospital’s help to get Ally well enough to go home. 2-18-10 11:30 am – Good news update! We had rounds with the doctors and the plan is to wean Ally’s bi-pap settings, meds and then treatments. We will continue IV antibiotics till we leave and then switch to oral if needed. They are also helping me coordinate some other medical things for Ally – vision, hearing, nutrition, dexa scan, and possibly a primary care physian from Childrens to oversee everything (Ally’s current pediatrician is at Lutheran General). Almost all of this will be done outpatient, but the hearing test might be able to be done today or tommorrow. We are doing vision and hearing just to be sure, although we don’t sense any problems. In addition, Respiratory Therapist Silvia, has been helping us a TON with Ally’s bi-pap masks, a humidifier/mount for her stroller wheelchair and some problems we had recently with our DME (including a $6000 bill for a humidifier). She is an angel and a wonderful addition to Ally’s team. I am glad and grateful to have some help as I usually try to coordinate everything on my own. I am also happy for the positive vibes today as Ally is MUCH better and her xray supports it too. I expressed my concerns with some of the big bumps we have encountered and I’m glad things are going smoother. Dealing with another issue with food services, but just got off the phone with the director and we will see what happens as Patient Relations gets involved. He agreed that the last thing I should be worrying about is food issues that have already been resolved in the past. I am not a witchy mom, just want the best care for my daughter and to be included in all decisions. Goal is to go home early on Saturday. We could really escape sooner, but the extra help with treatments will help Ally be at the strongest point possible. I’m feeling better with medicine, but I’m pretty sick if it wears off. Can’t wait to sleep in my own bed and be together as a family. Thanks again for everyone’s prayers, support, ecards…. I’d be lost without my family and great friends. Sorry it has been several days since I upated as I know some of you have been waiting patiently to know if Ally is better. Unfortunately the last couple of days have been quite the bumpy rollercoaster ride for Ally, and especially me. Ally began more fevers, that have spiked to 102, and stayed consistently at 99-101. This meant that we needed to poke her (only 2x though) to get an IV to be on stronger antibiotics. They are still mostly thinking this is viral, but she has grown a small amount of pseudomonus, strep pneumonia (different than strep throat) and the staph aurous has grown MRSA again. We are now treating the first two with ceftaz antibiotic and have left the MRSA alone since they don’t think it is causing all the trouble. Unfortunately, depending on the shift of docs, hospitalists, nurse practicioners, nurse management and respiratory managers, things have been MUCH more stressful than needed. Not everyone remembers or seems to care that I am an equal part of the team caring for Ally. 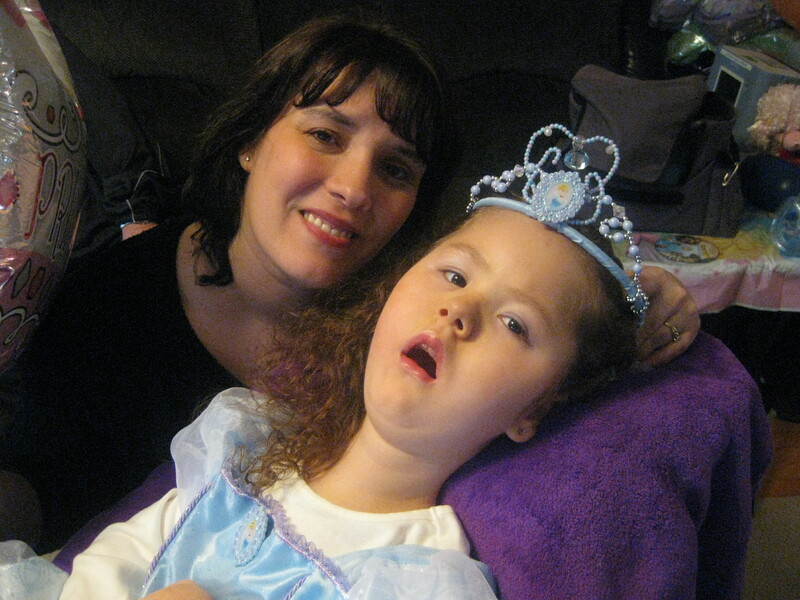 I know that everyone is trying to get Ally healthy and they have some great medical experience to help her, but ultimately I am in charge of making the final decisions that affect her life and I MUST advocate to have consistency in care. I won’t go into too much detail, but I will say I am grateful to nurse practioner Shamik, fellow Scott Wise and some others for taking the extra time to discuss Ally’s care with me in great detail and I am grateful to those that look at this from a family prespective of what it’s like to be in the hospital with a child that may one day die of respiratory failure. Overall, the good/great is that Ally has remained more stable, not using any oxygen between treatments and she is in mostly good spirits tolerating her treatments and enjoying her movies, cards, music therapy…. One reason why Ally has stayed stable and is improving (finally) is that she has had mostly the same nurses and respiratory therapist caring for her. This is one of the most important thing when in the hospital, so I can get a little break and true help. It also makes it easier and less stressful for Ally. I have had to do a ton of the coordinating myself, but this is also improving. A HUGE thanks to RN director Kathie Seerup, RN mgr Lora Byrne, RT director Anne Pollito, RT manager Tracy and the nurses and therapists who understand why a consistent team is needed and have taken the extra steps to ensure the hospital staff do their best. I’d name all the EXTRAORDINARY, OUTSTANDING nurses and therpists who have been helping Ally and I, but I’m aftaid to forget someone. If reading this, YOU know who you are — Thank you for all your efforts and even friendship!!!! Ally had a much, much better day on Wednesday and her left lung is finally opening up and secretions are getting better. Fevers are still there, but Ally is on IV antibiotics and stable. My “new” hope is to go home Friday, Saturday, or the latest Sunday afternoon. I could possibly handle this at home immediately, but I don’t want to be the person to cause Ally to have a setback. I need and greatly appreciate the hospital help in caring for Ally when she is this sick. We are going on Day 8 in the hospital and I couldn’t have kept up at home with this round the clock care. I am now, SICK again. I did make it to an immediate care center and do not have strep, but the doc did give me an antibiotic to be cautious. I’m also drinking lots of hot honey/lemon water, taking mucinex and lots of tylenol, motrin and throat lozengers. I have faith that Ally and I will both be better really soon. If this happens, I am VERY, VERY excited to be chaperoning on a field trip to Navy Pier’s Shakespeare theatre with Kristyn and the junior high on Monday. If you haven’t checked out other blog/jounal entries, they can be seen on her website www.angelally.com The 2/15/10 entry includes some nice pictures of Ally and how we are doing at the hospital (she actually looks really good for someone with a severe illness). If you haven’t heard from me in awhile, you might check to see if I updated her this website and you can also sign up for automatic email alerts when I update on her site (right column, near the top). Here’s another link with a short video about Dr. Schroth and Madison’s philosophy on caring for SMA children to give them the best quality of life possible. http://www.uwhealth.org/video/beyond-expectations-the-sophia-doebbert-story/26423 It includes an SMA Type 1 child over the age of 6, Sophia Doebert, and her family. 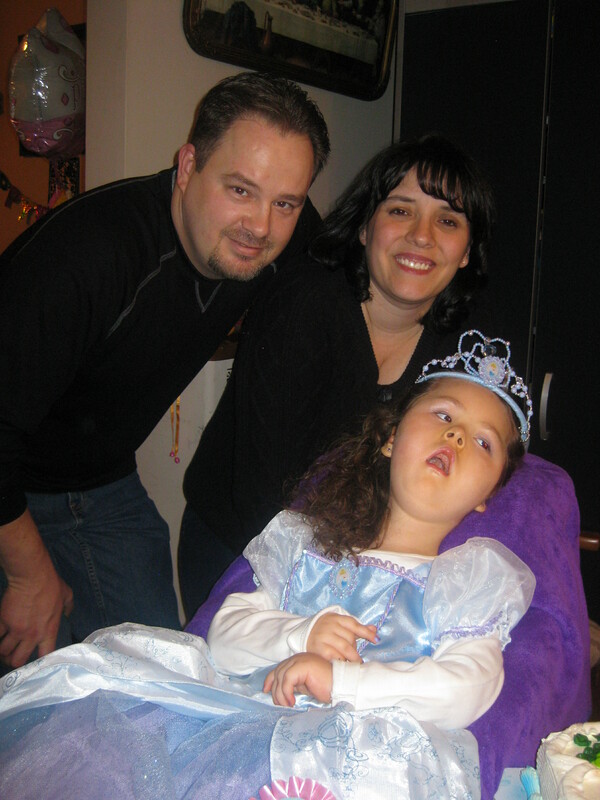 No family should be told upon diagnosis of SMA to let your child go to heaven and that nothing can be done. Sophia’s mom once called me during an illness to help Ally out and I enjoy doing that for other families too. I have high hopes that Childrens will continue to grown in its care for SMA children and always present options for families to choose from. Please say a prayer for Emily Rios who is type 2 SMA, 2 years old, and is also in the hospital here at Childrens Memorial of Chicago. Also prayers for anyone suffering an illness right now. We have absolutely wonderful friends and family praying for Ally. Once again, some of you have asked what you can do to help Ally or our family. Most important is your prayers and well wishes. My mom and Billy are taking care of Melissa and Kristyn, and they are doing pretty well and visiting every couple of days. If it snows, my mom is unable to drive the girls due to her spinal fusion healing, but so far she is doing wonderful handling them and feeding them. Something that can be difficult while in the hospital and soon after discharge is meals. I do not want my friends to ever feel obligated, but if you ever want to send a meal to the house during or after hospital stays, it is one the most helpful and kind things that can be done for our family. I also talked with the hospital social worker and she suggested that family and friends might be able to help with Meal giftcards for places around Childrens or our home. We can go there for a mini break or have them delivered to the hospital/home. We are unfortunately stuggling a little financially and it gets worse with Billy working less hours while Ally is in the hospital and then add gas, parking, and take out food, it gets super tough. Not sure the best way to work out meals, but I will try to make a list of places we tend to order from when in the hospital with numbers. Some that quickly come to mind are Nesh, Bougeois Pig Cafe, Starbucks, Dairy Queen, Pita Pit, Chiptole, Subway, McDonalds, Bacino Pizza, Thai Bowl, Pasta Bowl…. really anything. The social worker said some places may allow meals or meal cards to be purchased on the telephone with a credit card. Again, prayers and well wishes is what is MOST IMPORTANT, but since some have asked, I will swallow some pride and give the meal idea, with the encouragement of our social worker. Thanks again for your friendships, prayers and support. Off to nap since it seems the Tylenol PM might be kicking in. She is in room 226 – Ally Krajewski. I read every card to her and they brighten our days! Before going to sleep (for hopefully at least 6 hours) thought I’d do another quick update. 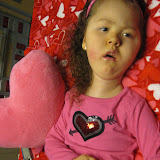 Ally had a good day with her breathing treatments every 2-3 hours and maintained her oxygen sats in between really well. Unfortunatley this evening she began a fever again (highest 101.8 and that was about an hour after 100.4 and motrin). The docs ordered another sputum culture and we did another strep test. We are waiting to see the “rapid” result of the strep and the cultures will start cooking to see what grows (plus we are still watching the other ones grow). My mommy gut says the strep will be positive (even though she was negative 5 days ago. My mom and I were positive for strep as well as Tammy’s kids, our MDA director (a couple days after seeing us), the older girls had symptoms and were treated and today, one of our favorite day RNs who has been following Ally tested positive and went home early to rest. I can only predict Ally has it since she has fevers and has been trying to cough and show discomfort. She is mostly happy and enjoying cartoons, but it is difficult when she attempts coughing. I guess we will find out soon or in the morning. I would like to share an AMAZING Respiratory Presentation presented by pulmonologist Dr. Schroth. She often travels around the US to different hospitals that would like to hear her experience with over 70 SMA patients and her successes and recommendations. Recently she presented to the medical proffessionals at Nationwide Childrens in Columbus, Ohio. 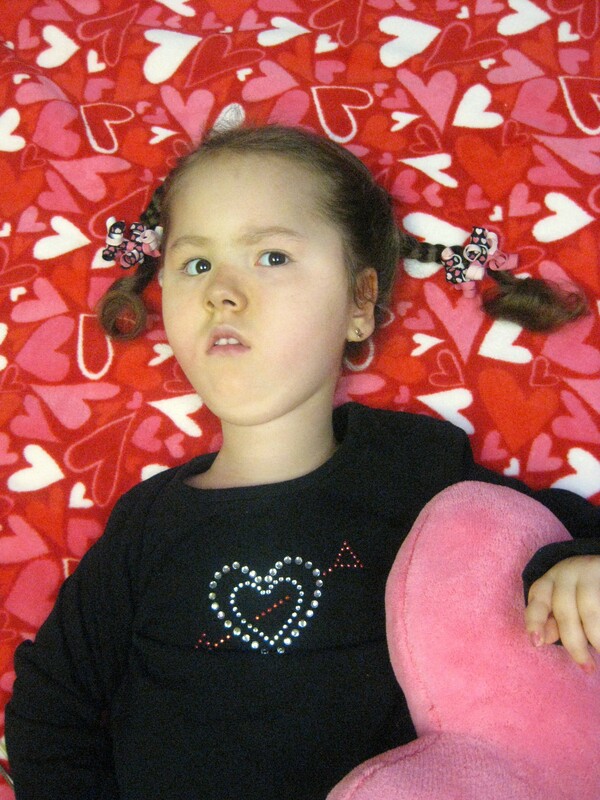 I am praying and hoping that one day Chicago Childrens Memorial will invite her to come here to present/share her expertise with SMA and the Neuromuscular Protocol that Madison WI has developed. In the meantime, maybe some of the staff will take some time to see this video and slide show. It’s also great for families to look at and learn from too. The link is http://nch.dataserv.tv/NCH/Catalog/ and by clicking on Respiratory Care Options For Children With Neuromuscular Weakness Let me know what you think about it, if you choose to watch it. Sorry for the delay in updates. We’ve had a few small rollercoaster rides dealing with SMA and illness, and tiny bumps with the hospital, but OVERALL things are going well as Ally finds whatever illness she currently has, probably mostly viral that takes time and lots of treatments. Sat – 7:40 pm —- Ally is doing good, still needs lots of treatments ot get her left lung completely open, but overall she is GOOD! Not sure how many more days of treatment every 2-3 hours and the extra bi-pap pressure it will take. So glad that things are overall going very well at the hospital with only a very few bumps. This is a rollercoaster, but we are doing okay. Little crazy/kinda silly situation. I can barely sleep at all this hospital stay, even when we have the best therapists and nurses super familar with Ally and she is stable. Two times, I tried 5 mg of ambien sleep pill, but the results were 5 hours of sleep on Thursday and 1 1/2 hours of sleep today. Without it, only 1-2 hours at a time. UUUggHHH! Any suggestions to get sleep???? Thought about a glass of wine or drink, but don’t have any here and wouldn’t walk to a bar alone or even want to be in one. CVS is kinda close, but its really cold outside. Not sure the best “drug” or natural remedy to buy either??? Help, I need to get a little rest, while I have GREAT help the next couple of days. Ally overall had a very good day of treatments every 3 hours. Her left lung is still diminished, but I think it will pop open soon and if things keep on this upward trend, maybe we will be home by Monday or so. We still need to go back to her home bi-pap and we don’t want to rush her and have a set back. I’ll try to update more tomorrow. Gonna try to sleep at the side of Ally’s bed for more than 3 hours tonight. Good news, we have tentative nursing set up through the weekend and early next week. The respiratory department is also trying to have consistency for Ally and are doing their best to give me a tentative team tomorrow. These efforts mean the world to me, Ally and our family. Thank you also to family and friends for the continued prayers, well wishes, and cards for Ally! Ally was having quite a bit of trouble yesterday afternoon with BIG desats during treatments and eventually no air moving in her left lung, so we switched her to the hospital Vision bi-pap (breathing machine) at 3:30 pm. We also switched her treatment to every 2 hours. I wasn’t surprised that she was getting worse, before better, but of course, I was a little more stressed and worried. I’m happy to say that the Vision bi-pap (at the same settings, but a stronger machine) has made a world of difference. 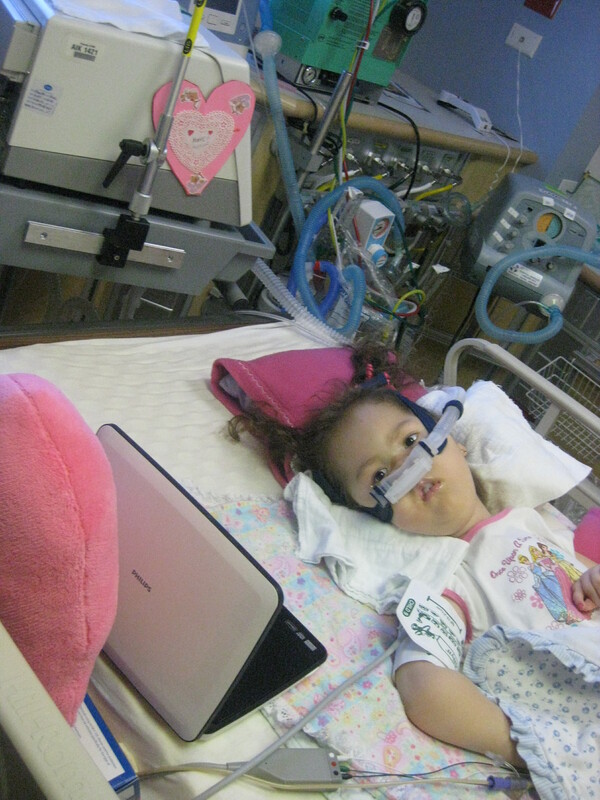 We immediately saw her breathing improve and her left lung began to move some air. The treatment every other hour is helping too. The nurse and therapist continue to get a ton of gunk out of Ally, but we are staying ahead of the game by doing it so often. Ally is not able to rest a ton, but she is not getting so worked up and no more BIG desats. Of course, it helps for her to be familar with the therapists and most nurses treating her. She has slept a little between treatments and is now watching her cartoons. I slept from about 11pm – 2 am, which doesn’t seem like much, but I feel okay and I’m wide awake. I can’t sleep here unless really tired, so I’ll just get some computer/paper work done and rest later. I am beginning an application to eventually get Ally a canine assistant/companion. I also have to finish my paperwork to attend an SMA family weekend in Kentucky at Camp for Courageous Kids in April. There’s always something to do to enrich Ally’s life or get her things she needs and deserves. Too bad I don’t have my taxes here to work on, but that would make a big mess with receipts and stuff. My mind is a little unsettled going into the weekend and not knowing who might be working with Ally in regards to doctors, nurses and respiratory therapists. One of our favorite nurses, Desty, took care of Ally Thursday daytime and will be with her during the day on Sat. and Sun., but we don’t have any clue who the rest of therapists and nurses might be. Of course, there are sicker patients that need to be focussed on first, but I’m praying the management might be able to give a tentative schedule of who might have Ally for a few days. This relieves some stress of the unknown and I can step away for a few minutes or possibly plan a meal out if she is with RNs and RTs that know her and her unique needs well. I’ll see what can be done on Friday, but don’t want to be demanding since overall things are going well. Thanks again for prayers and support. Hope everyone else is staying healthy and warm!